San Francisco based artist Cassandra Seeger began drawing as a child, precociously playing with paint and studying during summers with artist Paul W. Wood in New York. Cassandra’s other early passion was ballet. This led to an exciting ten year career as a professional dancer, performing leading roles with Pittsburgh Ballet Theatre and Ballet Arizona, touring nationally and internationally. With her training focused on stage production and characterization, the esthetic elements of costuming, lighting, music, and drama had such an osmotic influence that much of her work as an artist today exudes the after-effects of this experience. Cassandra was born in Plymouth, Massachusetts, in 1972, and she grew up among a family of sculptors, painters, potters, and musicians. With a folk-singing grandfather and great-grandfather who designed theatre sets in the 1920’s, some say that creativity is in her genes. 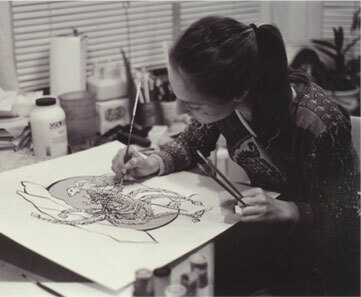 In 2001 she refocused her ambitions towards art, graduating with a BFA in Illustration with Distinction from the California College of the Arts. There she had the opportunity to show her work in two solo exhibitions within the same year as her graduation. She followed that up with another two solo shows in San Francisco in the summer of 2006, and is currently working on pieces for an upcoming show of illustrative paintings. Her clients include Netroots Nation, United Methodist Publishing House, Kunst-Stoff Dance, San Francisco Youth Ballet Theatre, and Turmoil music. Her paintings, illustrations, and portraits are in private collections throughout the U.S.A.